Roger. Call the ball…. Top Gun Day is May 13th. What is Top Gun Day? Well it’s like talk like a pirate day, only way cooler because it allows you to quote Top Gun all day long, wear aviator sunglasses (no matter how cheap), pretend you’re a fighter pilot (“it’s time to buzz the fridge”), play volleyball in jeans, and drink Hemlock–wait, wait–I mean ICE water. Participating in Top Gun Day is so easy even Slider can do it (read the next post title, “How do I Participate?”). Now that you’re convinced that this is the best day ever join us on our Facebook Fan Page and recruit your fellow naval aviators by spreading the word on Facebook and Twitter. 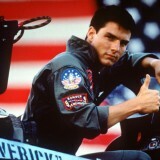 We also have a You Tube Channel filled with all sorts of Top Gun movies! Very excited! Nothing like celebrating a classic! Im so stoked! Ill be decked in top gun stuff, you can count on it! We do, http://www.topgunday.com/quotes. Will be adding more as well. You need to have a page with Top Gun quotes to jog memory & enable Top Gun talk. Stuff like http://www.retrojunk.com/movie/quotes/22-top-gun/ & more. Heard you on KROQ this morning. Hilarious! I totally support your cause. There is a bar in San Diego where they filmed the Piano scene. We went there a few months ago – Total disappointment.